The government and the Church have a sure foundation for the family, said the Mayor of La Carlota City in a statement. He is as one of the 4 key persons invited by the Church of Jesus Christ in La Carlota during its culminating activity. The Church of Jesus Christ of Latter-day Saints, La Carlota Philippines District kicked off their closing Family Week celebration by a foot parade in the main thoroughfares of the city. Though rains were pouring early in the morning, the said activity wasn't affected. It carried as plan. The members and leaders of the units or branches of San Enrique, Ayungon, Masville, Manggapsang, La Castellana, Moises Padilla, La Carlota First, and La Carlota Second joined the whole day affairs of uplifting messages, parlor games, and cultural presentations. This culminating activity of the 26th National Family Week celebration 2018 of La Carlota Philippines District is centered on its theme: "Tungo sa Maginhawa, Matatag at Panatag ng Pamilya 2018". The City Government of La Carlota, the Department of Social Welfares and Development (DSWD), the PhilHealth, and the Church Welfare Service provided vital info on how the family may survive in this present time of economic crisis and poverty. "The City Government of La Carlota is happy to join hands with the Church of Jesus Christ of Latter Day Saints, La Carlota City Philippine District in celebrating the National Family Week every last week of September of the year. This is the 26th year of celebration with the theme "Families and Inclusive Society" under the international umbrella organization which is the United Nations. "In La Carlota City, our City Social Welfare and Development Office offers various initiatives, over and above the regular components of its daily offerings, in order to promote the democratization of the country's wealth, spreading services to those who are in need despite the distance of services from the beneficiaries, or accessibility of the identified end users to the venue of services, leaving no group or person behind. 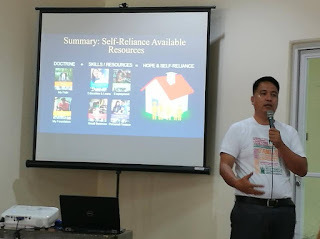 "The CSWDO-DSWD held a "Two Day" Orientation on various Alternative Parental Program for the trainers to be briefed, specifically, teaching the Barangay Health Workers, Brgy. Captains, Kagawads and Committees on Family Life and Children per barangay, for them to impart to their peers and apply in there (sic) life's experiences. "We are of the belief that the government, in unity with the local organizations and churches, specifically, the Church of Jesus Christ of Latter Day Saints, La Carlota Philippine District is well grounded on the noble intents and purposes of the institution in recognition of the sanctity of the family and the moral responsibility that it owns in charting the destiny of each of the family members, especially the children. "Our deep appreciation goes to the support of the church in strengthening the bid of the City Government for a sustainable and inclusive society that we all aspire to build for our families, our communities and our PEOPLE..."
Ms. Marlyn Delgado of DSWD, Mr. Mark of PhilHealth, and Brother Erwin J. Boiser of the Church Welfare Services particularly in self-reliance program. Ms. Delgado relayed thoroughly the basic services of the DSWD particularly for the poor and the needy. While Mr. Mark apprised the members of the Church on how to enroll or become member of PhilHealth and be entitled of the medical assistance benefits in-patient or out-patient. Bro. 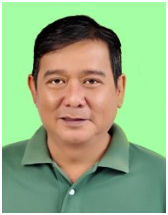 Boiser reemphasized the services offered by DSWD and PhilHealth in a three steps or things to do as part of values transformation. First is go, then share, and the last is prepare. He assured the members if they do their part, those agencies or services would be of great help. Thus, if they help themselves, they could avail of those services for free or minimal expenses on their part.